Wow! 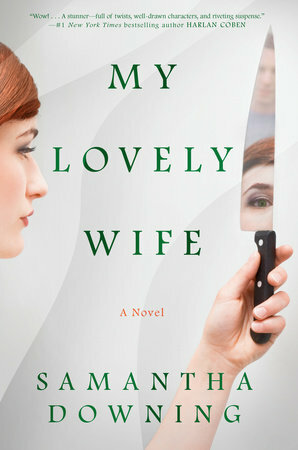 I picked up MY LOVELY WIFE by Samantha Downing not knowing how seriously twisted this book is. I should have known when the description compared it to Dexter that it would be quite the ride, but I honestly still can't believe the premise of this book! And I'm not sure what this says about me, but I seriously enjoyed it! MY LOVELY WIFE tells the story of a husband and wife team who prey upon and then eventually kill women. Yes -- you read that right! I don't want to give too much of their backstory away because the reader is (gently -- haha!) eased into their story; but at its simplest, these two people fell madly in love, had kids, and struggled with money issues like any "normal" family. The only difference is that they got bored and found that killing people was exciting for their marriage! Along with the character development, I also really liked the twists in this story. When a few things started to go wrong with the murders, this couple decided that they could outsmart the police. They both worked together (although I'd argue that they both kind of did their own thing too) and set up a man who had been released years ago for some suspicious crimes and subsequently disappeared. Pretty smart, right? I don't want to reveal what happens, but suffice it say, that things didn't go exactly as this husband and wife team planned! The pacing of the novel is excellent -- this book is definitely a page turner, and I appreciated how the book worked up to its insane ending. Just based on the rest of the novel, I had a feeling that it was going to be a doozy... and it most definitely was. And just when I thought it couldn't get any crazier, it did! Now doesn't that make you want to pick up this book? As you can tell, I really enjoyed MY LOVELY WIFE. Highly recommended for fans of twisted thrillers! Oh man, that does sound twisted! I need to move it up my TBR for sure. Wow! This sounds like an incredible read! Thanks so much for the awesome review.